Educate… the Canadian public on mining injustices in Canada and around the world. Advocate… for stronger community control of mining practices, and in support of self-determination in mining-affected areas. Agitate… against corporate impunity and in support of substantive regulatory change. Mass mobilization: We consider public education and awareness to be crucial for the mobilization of people for change. Through public acts of protest and popular education, we work to bring the stories, experiences, and strategies of mining affected communities and their advocates to be heard in Canada. Indigenous sovereignty: We strongly support the self-determination of communities, especially the self-governance and sovereignty of indigenous peoples. Mineral exploration or exploitation must not proceed without the free, prior, and informed consent (FPIC) of affected communities; these communities should have the right to stop such projects and choose the type of economic activities in which they wish to engage. Anti-capitalism and anti-colonialism: We believe in the global call for environmental, social, and economic justice and often participate in, and support, social movements that articulate these causes. We reject the current economic system, which accumulates wealth without redistributing the benefits. We denounce and organize against a neo-colonial system that promotes resource extraction as a form of “development” and “progress.” We do not consider the transference of wealth from communities to foreign companies, pollution of natural environments, and persistence of human rights violations a viable model of development or progress. In solidarity with impacted communities, we fight against corporate impunity both abroad and in Canada. Transformation over reform: We support substantive legislative and regulatory changes to reduce the negative environmental impacts of the mining industry. At the same time, we recognize that mining activities will always disturb the natural environment and carry great environmental and health risks, regardless of mitigation efforts. We reject “green-washing”, “corporate social responsibility”, voluntary principles and other meaningless industry jargon. We recognize and challenge the ideological connection between the Canadian government’s neoliberal policies at home and its promotion and subsidization of Canadian mining activities abroad. Criminal justice system: We believe that the Canadian mining industry should be held accountable for their frequent disregard for human and non-human life while simultaneously wishing that the only mechanisms for doing so – through the criminal “justice” system – weren’t the same mechanisms that cause so much violence towards Black, Indigenous, poor, migrant, and disabled lives in this country. Just like the paradigm of extractivism, the prison paradigm cannot be rehabilitated. Our policing and criminal “justice” system was built to patrol borders, to control and contain rebellion, and to maintain colonial force over indigenous people. It continues to do exactly what it was built for. 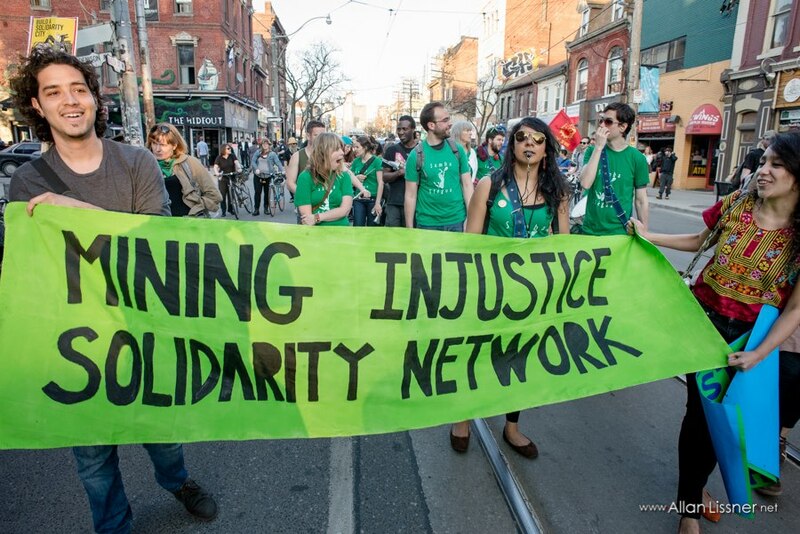 We believe in working towards a means of ensuring justice, safety, and self-determination for all people that doesn’t rely on reinforcing a system of exploitation, isolation, and incarceration of the most oppressed people in Canada. Read our statement on mining justice and Canada’s criminal “justice” system here. Labour rights: We join in the struggle for the human rights of affected communities, company mine workers, and artisanal miners. We support their right to organize collectively, form unions, call popular assemblies and speak out against oppressive and violent tactics by governments and corporations to suppress their human rights and livelihoods. Gender justice: We are particularly concerned about the negative impacts of the mining industry on women and value gender equality in our organizing, and thus take a feminist lens in our work. Access and care in activism: In addition, we strive to organize in a way that respects and celebrates the different experiences, identities, and needs of our members.